From my first visit to Honduras as a tourist in 1969 to the present day, I have witnessed many dramatic, and sometimes unsettling, changes in Honduras. 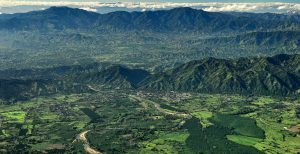 At the time I arrived in Honduras, I described this beautiful, green, mountainous Central American country as a “sleepy”, tranquil, mostly agricultural country, with the majority (2/3’s) of the people living in the rural areas. People seemed not to want for much; they appeared content scratching out a living planting corn, beans, vegetables, and coffee, while raising chickens and pigs. Malnutrition was extremely rare because rice, beans, and tortillas gave them a healthy diet, especially when they were able to add protein from the chickens and pigs raised to their diets. The children in the rural areas went to school in a one-room school house and when it was harvest time, the school would close so the kids could help with the harvest. Crime was pretty much limited to kids stealing clothes off the line left hanging out at night, but you didn’t have to worry about being mugged, kidnapped, or having your valuables stolen off your person. Hondurans loved to stay in their beautiful country and there was only a small percentage of immigration to the United States. This is a thumbnail sketch of Honduras during the 1970s. With the ushering in of the 80s, the region began to change. There was destabilization of our Central American neighbors, El Salvador and Nicaragua, as the killing of Archbishop Romero in El Salvador and the Contra War were the headlines of the day. Nicaraguans began streaming into Honduras, many escaping the leftist controlled government, which brought chaos and more violent crime. This was the beginning of the present-day unsettled life in Honduras. The 90s began a whole new era for the country. Clothing assembly plants were beginning to crop-up around the country, especially in the North Coast areas. People began leaving the rural areas looking for better opportunities, better education, and a more prosperous life. What they discovered in the cities was a different reality. Children had to wear uniforms to school and wear shoes; books and materials had to be purchased. If the children could not afford to go to school, then they were often left at home to take care of themselves because the extended family members remained behind in the rural areas while the parents went to work in the factories. Along with the clothing assembly plants, came the proliferation of shopping malls and fast food restaurants. Honduras was beginning to show a different face. Gang members that had been in the States for years were deported to their countries of origin only to repeat what they learned in Los Angeles where the Salvatrucha-13 and the 18th Street gangs originated. At the end of the 90s, Honduras suffered the worst natural disaster in recorded history of the America’s, Hurricane Mitch. 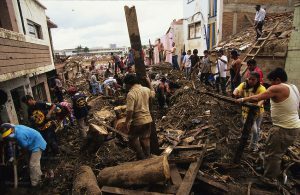 Over 10,000 people were killed in the region and 80% of the national infrastructure was destroyed during the category 5 hurricane that remained stationary over the country for 5 days. Life was chaotic, crime continued to increase and drug dealers from other countries began to pour into the territory because of the strategic location and accessibility to move drugs to the US. This was the backdrop to the beginning of Our Little Roses Ministries in 1988. We set out to rescue girls who were on the streets, begging, and left without hope. I was acutely aware that there were many Homes and Institutions that cared for boys because I had visited one in Tegucigalpa. I was very impressed that there was a wonderful opportunity to bring a new life to these children that had once been so vulnerable, malnourished, sleeping and begging in the streets. When I asked some juvenile authorities what happened to little girls who were abandoned and abused, the answer was that there were no Homes for girls. In order to rescue them they had to be sent to the Women’s Penitentiary or to a reformatory because no one wanted to care for girls. In my heart I knew the only way to change the future of Honduras would be through their best resource available, GIRLS. Why girls you might ask? Because they will be the nurturers of their children and if we educate girls, provide them with the tools that they need to be successful in life, they will never go back to the abject poverty that they once came from. Not themselves and certainly not their children nor their children’s children. Generational change is what will happen, and it will provide future leaders for their country. We know this because we have the statistics to prove the success through education. Throughout our 30 years, 95% of the girls that have come through OLR have graduated from High School as opposed to 7% in general for Honduras. 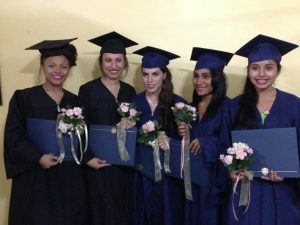 Moreover, 20% of the girls of OLR have graduated from University, as opposed to 6% in general for Honduras. Of those that have obtained a bachelor’s degree, 5 have master’s degrees and one is a Cosmetic Dentist specializing in implants with a private clinic and teaches at the National University. How did this happen? It happened only through a concentrated effort and focus on providing the best education possible for each of the girls according to her individual abilities and interest. Our Little Roses is a solution to the growing problem of immigration. Our statistics show that 86% of all the girls who come through Our Little Roses stay in Honduras, 7% have immigrated to the States, and 7% live in other countries (Costa Rica, El Salvador, Mexico, Spain, Germany and Holland). The girls stay because they are able to find good jobs and achieve their goals in their home country! Over the years, Hondurans have become desperate looking for a better future. Single mothers, of whom the majority live in poverty, comprise 53% of the country’s overall population. Just as in the late 80’s and the 90’s when families began leaving the rural areas, Hondurans once again are searching for job opportunities, education, and economic means for themselves and for their children. Poverty breeds desperation. Without job opportunities and without hope, they choose to move North. Our Little Roses is a beacon of hope for the country and a glimpse of what the country can achieve if children are given a good education, proper diet, and health care. 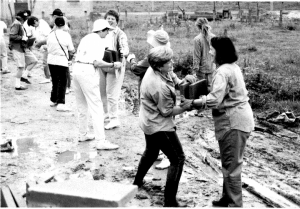 For the past 30 years, Our Little Roses has dedicated itself to EDUCATION, saving countless lives from extreme poverty, neglect, and hopelessness. The Home has prepared, and will continue to prepare, girls for the future of Honduras. I would say, let’s invest in education for the future of Honduras and, without a doubt, let’s invest in a girl’s education that will change the future of the country for generations to come.